While each month holds something special for everyone who adores jewelry, April is a little more exciting for jewelry lovers in Jacksonville as we explore the world’s most beloved gemstone- the Diamond. In the month of April we also celebrate Easter and Spring! Join us in a journey of dazzling facts, gorgeous jewelry and wonderful gift ideas to celebrate April and all that it brings to its fullest. 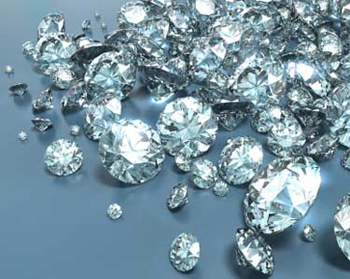 Contrary to popular belief, diamonds do not “shine”, nor do they merely reflect light. Diamonds are unique because they actually refract light into all the colors of the rainbow. You also may be interested to learn that light enters a faceted gem from all sides, and may bounce several times inside before it cleanly shoots out. This accomplishes what we actually see in a diamond, all of the rainbow’s colors. Red, orange, yellow, green, blue, and violet bend and reflect inside the diamond to showcase its cut, color and clarity to the beholder. The traditional birthstone of April holds meaning for those born in this month. It is thought to provide better relationships and inner strength. It’s also a commonly held belief that wearing diamonds brings the wearer other benefits such as balance, clarity and abundance. Diamonds are a well known symbol of eternal love, and those born in April enjoy this rare gem as their birthstone. April Special- 20 to 30% on select jewelry items! At Allen’s Jewelers, we take our jewelry very seriously. We don’t just offer you that same, recognizable piece you could find from anywhere and on everyone. The Allen’s Jewelers Team searches the world for the finest diamonds and diamond jewelry to offer you the most unique and special selection right here in Jacksonville. Our skilled and highly trained gemologists hand-pick the best diamonds: verifying grade, quality, color, and luminosity, to make sure every diamond offered by Allen’s Jewelers will be a beautiful memory for you and your loved one for years and years to come. Take an opportunity to visit the diamond section of our website for an idea of what we offer or better yet- come in and see our fine selection of exquisite diamonds. You’ll be glad that you did. Everyone celebrates the much loved holiday of Easter in their own way. For some families it’s full of rich Christian traditions and for others its a time to celebrate and welcome Spring, rebirth and being with family. No matter how you celebrate Easter, Allen’s Jewelers can help you create a memorable Easter tradition with a meaningful and beautiful keepsake that is sure to become a loved family treasure. Our wide selection of pearls, from freshwater cultured pearls to more exotic cultured pearls such as Japanese Akoya, South Sea, and Black Tahitian, holds the meaningful and memorable Easter gift you’re looking for. Get an idea of the unique pearl jewelry we offer from our website or come into our showroom and allow a member of the Allen’s Jewelers Team to help you find the perfect selection of jewelry. Spring is an exciting time. It is a time for newness, the awakening of nature, and if you’re like most people- Spring Cleaning! One of our favorite things to do each spring is to clean out that jewelry box. Even just one new special piece can give your entire collection the refresh it needs. 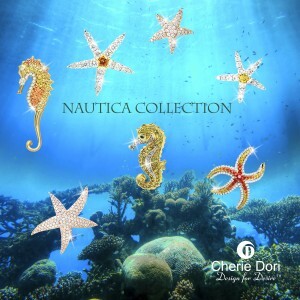 Cheri Dori’s Nautica Collection is perfect for such an occasion. Glamorous designer Cherie Dori launched her delectable Nautical Collection and it’s a perfect fit for Springtime in Florida. 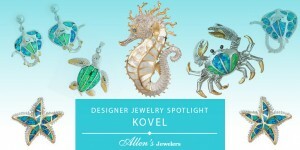 The collection features seaside treasures like a dazzling seahorse and the sculptural starfish. The fluid lines of form mesmerizes in diamonds and colorful precious gemstones all set in 18k white gold. Follow your heart with a jewelry design by Cherie Dori. Whether you have questions about a jewelry repair, designing a custom piece of jewelry or unique gift ideas, stop in and visit Allen’s Jewelers showroom in Jacksonville or call (904) 221-9998 to speak with a member of the Allen’s Jewelers Team. We will help you find just what you’re looking for. 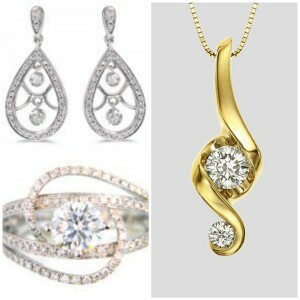 Make sure you stop in to take advantage of our April Special: 20-30% on select jewelry items!